This top-rated Detroit escape room is an adrenaline-filled, one hour long experience that puts your inner Sherlock Holmes against a bloodthirsty zombie. 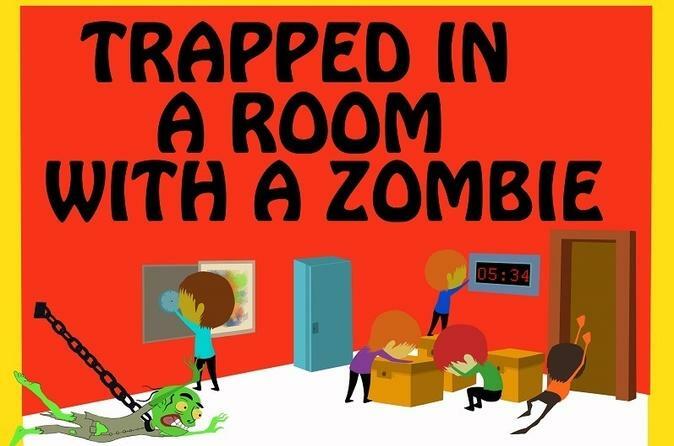 Find the clues, solve the riddles, get the key, and escape before the zombie's chain gets long enough to make you dinner! Don't worry, this isn't a haunted house. It's a fun and funny experience that will leave you exhilarated, if you survive, that is. When you arrive at Detroit's historic Penobscot Building, you'll sign a waiver and put on your name tag - here's your chance to be your favorite Walking Dead character. Your friendly host then explains the rules. From there, it's all about survival as you and your group work together to solve the puzzles and unlock the key to freedom. Before or after your event, enjoy one of the many great restaurants within a block or two of the building. These include Detroit's historic Lafayette Coney Island, the beloved Grand Trunk Pub, and the trendy Dime Store and Townhouse. You can even go ice skating (weather permitting) across the street at the always bustling Campus Martius.